Are you thinking what I'm thinking B1? I think I am B2! It's birthday party time! 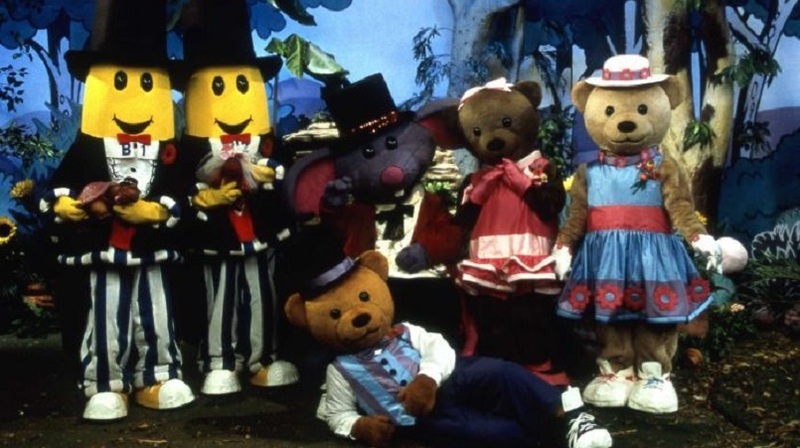 The concept for the show was inspired by the success of the song Bananas in Pyjamas, written by Carey Blyton in 1967, that had become a regular item on Play School. The series became a huge success and was syndicated to many countries around the world and dubbed into other languages over its 10-year run. Co-creator and lead writer Simon Hopkinson came up with the idea for twin bananas and three teddy bears in the back of a taxi after leaving a briefing at the ABC. "I thought it would be fun if they were one character in two bodies, so they were always in sync and they always knew what the other one was thinking," he told ABC Radio Canberra's Lish Fejer. The one requirement in the brief Hopkinson was given: the show had to be "pure delight for its young audience". "I didn't realise how radical that was, because shows like Sesame Street all had very conscious education or social agendas and it was delightful to work on a program where the brief was 'it had to be entertaining'," he said. "We had an unspoken rule that if a story idea didn't make us laugh then it wouldn't pass muster. "Why should we expect small children to laugh at something we didn't think was funny?" Hopkinson, along with Richard Tulloch, wrote 300 episodes for the show. "After 40 episodes, we said we really do need an antagonist, we need someone to stir things up a bit and that's when we introduced Rat-in-a-Hat as the Alan Bond of Cuddles Avenue," he said. For 10 years B1 and B2 were played by Ken Radley and Nicholas Opolski, creating and on-screen chemistry loved by children around the world. The NIDA classically trained actors recalled having to work hard to bring B1 and B2 to life. "We had to do everything about 10 times bigger than you really would because otherwise it looks like a sack of potatoes," Radley said. "It was absolutely exhausting because there was so much energy going on from within that costume — and the Bananas lived a life at a higher pitch to start with — we'd be absolutely exhausted by the end of the day," Opolski said. The costumes were hot and uncomfortable, the pair remembered. "The original suits, the fibre glass heads were attached to push bike helmets we carried the weight on our heads so our necks were unhappy about that," Radley said. "For series two, the heads were attached to backpacks ... so when you moved your body around and the shoulders and the back was taking the weight instead of our heads." And they could see very little through the black mesh of the Bananas' frozen smiles. "When we had rehearsal Nicholas and I became fantastic at working in tandem," Radley said. "In the end we could do all the moves by feel and memory — it looked clumsy because it was but we became very good at it." Bananas in Pyjamas was revamped in 2011 as a CGI animated series created by Southern Star Entertainment which ran for three seasons. Both the classic live-action and the animated version still air on ABC Kids daily. The Bananas in Pyjamas series first aired on Australian television in July 1992.